Don Mullan’s ability to utilize historical symbolism, as a method of informing and influencing the present day, first manifested itself with a major International Conference on World Peace and Poverty to celebrate the 800th anniversary of the birth of St. Francis of Assisi (1182-1226). Mullan hitch-hiked from Paris to Assisi in the summer of 1978 with a friend from Derry, John Coyle. They travelled on a budget of 2.50 per day, and slept in a tent. That journey became the inspiration for the international conference in 1982. Mullan was particularly drawn to the universal appeal of St. Francis of Assisi, which transcended both Roman Catholicism and Christianity. 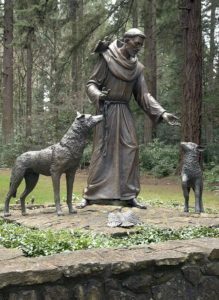 St Francis is the patron saint of peace, animals, ecology and stowaways, all of which offered to Mullan’s creative mind the opportunity to explore related themes pertaining to the local, national and international community. Recalling the quotation of Mahatma Gandhi that ‘”he Earth has enough for everyone’s need, but not enough for everyone’s greed,” Mullan was particularly drawn to St. Francis’ commitment to simplicity of lifestyle which, again, resonated in a world of growing inequalities. During his time at the Development Studies Centre, Dublin, Mullan came to realise the importance of listening, especially to the voice of the majority world, then referred to as the ‘Third World’. The St. Francis Conference, therefore, had participants from Asia, Africa, Latin America, as well as Europe and North America. The conference was particularly unique as AFrI decided to hold it, not at a conference centre or hotel, but within the inner-city parish of Sean MacDermott Street, involving the local community both as presenters, as well as organizing volunteers. It was chaired by the Nobel and Lenin Peace Prize winner, Sean MacBride SC, and was attended by, amongst others, Rev. Jesse Jackson and Desmond Tutu (via video, as his passport had been confiscated by the apartheid regime). The Irish media largely ignored the conference, much to the ire of Sean MacBride who was deeply critical at a poorly attended Press Conference on Monday, 1 October 1982. Unfortunate for AFrI, on the weekend of the conference, an attempted overthrow of the then Taoiseach, Charles J. Haughey TD, had occupied the attention of the Irish media. However, the highly popular BBC Radio programme, ‘Sunday Sequence’, sent an outside broadcasting unit and dedicated an entire programme to the conference. Related to the St. Brigid’s Peace Cross Campaign, AFrI brought a large group of young people to Assisi in 1995 to explore themes related to justice, peace and human rights. Mullan is currently thinking about a follow-up conference in 2026 to mark the 800th anniversary of the death of St. Francis of Assisi. 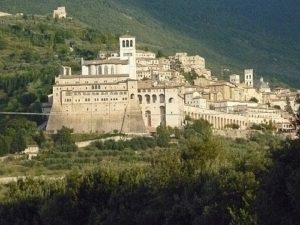 He has begun to explore with members of the Franciscan Order and the Roman Catholic hierarchy the possibility of a five-year global pilgrimage of the relics of St. Francis of Assisi. Sean MacBride SC became AFrI Special Adviser and Desmond and Leah Tutu accepted Mullan’s invitation to become the patrons of AFrI.